Williams' La Concha Motel (Las Vegas, 1961). And unlike most modernist architects, who regard modernism as the only way to design for reasons that are as much social and moral as aesthetic, Williams had no compunction about designing modern for one client and historic for another. 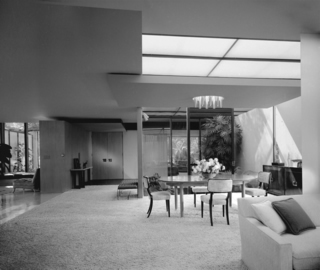 Williams' own home, a charmer with glass-walled ‘lanai' room opening onto a rear garden, suggests “an odd hybrid of Corbusian modern and Hollywood Regency” to Leslie Luebbers, director of the Paul R. Williams Project at the University of Memphis. A modern Williams' home design, 'Sunshine Manor,' from his 1945 book The Small Home of Tomorrow. The home, built in 1952, was in Lafayette Square, a neighborhood of large, mostly Period Revival homes, many dating to the 1920s. Originally an all-white neighborhood because of deed restrictions that banned blacks, it integrated in the late ‘40s and became a mostly black neighborhood by the ‘50s. The home catches the essence of Williams' architectural style—which bears a strong resemblance to his personal style. “He was a sweetie pie,” Hudson remembers, recalling a grandfather who loved tennis and dancing, dressed impeccably, befriended his clients, enjoyed the latest gadgets and the music of Duke Ellington, and gave his grandchildren a backyard rollercoaster. Lumley home (San Marino, 1959). “Affable, well-mannered, gracious, and graceful,” is how the late African-American architect Max Bond, who worked for Williams one summer along with Jeh Johnson, describes Williams' work, adjectives that apply equally well to Williams himself. “Almost melodic” is how one fan described one of Williams' traditional mansions in the wealthy Los Angeles enclave of Holmby Hills—a description that fits much of his work. On the surface, Williams' own home—which has been lovingly preserved by Hudson, who lives there—might fit the definition of ‘Streamline Moderne,' thanks to its curves—the lanai is oval, and the garden's brick wall undulates like a serpent—and the ship-like prow that juts out over the lanai. But, like Williams' other ‘Streamline' designs, the term doesn't really fit. His buildings don't resemble machinery, airplanes, or even ships. Williams' curves, rather, suggest clouds. Undoubtedly the most Moderne elements in the house are the golden leaping gazelles that spring up the main stairway—a curving stairway, of course, very much a Williams trademark. 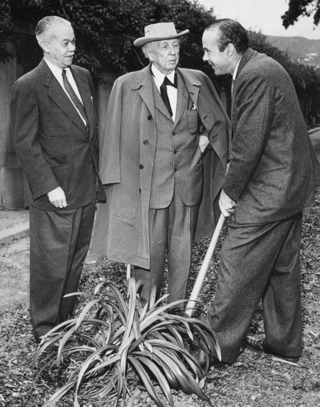 Two masters: Williams with Frank Lloyd Wright, early 1950s. Delightful, curving ceilings—oval, round, or freeform—and delicate wrought-iron tracery define his work. His interiors are sumptuous but, thanks to his taste and subtle humor, never pretentious. It's remarkable how closely Williams' modern work resembles his period designs. Both often feature double-height, curved entries, porticos, and bays—the bays often filled with floor-to-ceiling windows. Williams' entries are often large and impressive, and in traditional designs wittily decorated with pilasters and ornate scroll pediments. His plans are often ‘splayed'—with wings that radiate at angles away from a central mass.